Last week Bill Lee wrote a controversial article in which he claimed that “marketing was dead” (yet another clever use of a traffic-grabbing title.). It was later (correctly, IMHO) pointed out that what Lee probably should have said was that “advertising was dead”. Regardless of where you come down on this debate, it’s nice to see a lively discussion around the disruption that social channels have wrought; despite the hyperbole, it’s still a significant pain point for organizations everywhere, and few have it figured out. However, at the moment, the conversation seems to be largely unsophisticated – more of a contradiction than a true debate of ideas (I’m reminded of the Monty Python “Argument” skit – where the argument becomes about what, exactly, constitutes an argument). So I’d like to throw another perspective into the mix. Marketing isn’t dead – the big disruption is simply that it’s now everywhere, and everything, that a company does. The author of this excellent post on why words matter (“I Won’t Hire People Who Use Poor Grammar“) probably didn’t consider how their headline would translate into an URL, which would explain why, from a metadata perspective (ie: if all you ever saw was the link, shared, unshortened, via email or elsewhere) you’d think the article was on a different topic altogether, a topic not likely to be covered by the Harvard Business Review. This is a personal example. It occurred to me several years ago that every time I (hopefully) leave a reasonably intelligent comment on a blog post, it would be a pretty good idea to help establish my credibility to make that comment based on where I work and what I do for a living. So I started including a little more metadata, and in the process ended up providing some incremental exposure and marketing for my company. Of course, these days it’s a foolish writer that doesn’t mention Pinterest at least once in every post! All jokes aside, Pinterest is a great way to check your metadata, and, let’s face it – as the fastest growing website ever, it’s also something you need to consider. 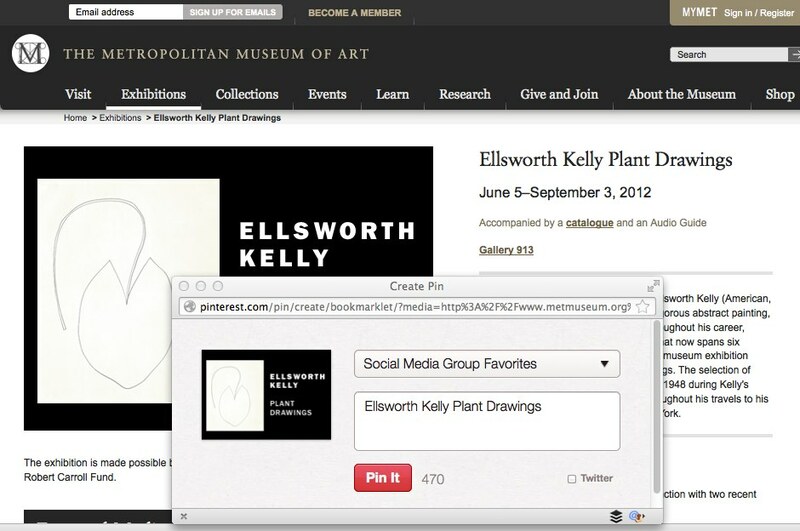 In this example, MOMA misses an amazing opportunity to promote their upcoming Ellesworth Kelly exhibit. By failing to provide the “what, when and where” in their image metadata, they’ve lost the chance to ensure that no matter where this file is shared (by someone interested in Ellesworth Kelly! ), important details will provide context and a marketing opportunity for the upcoming show. 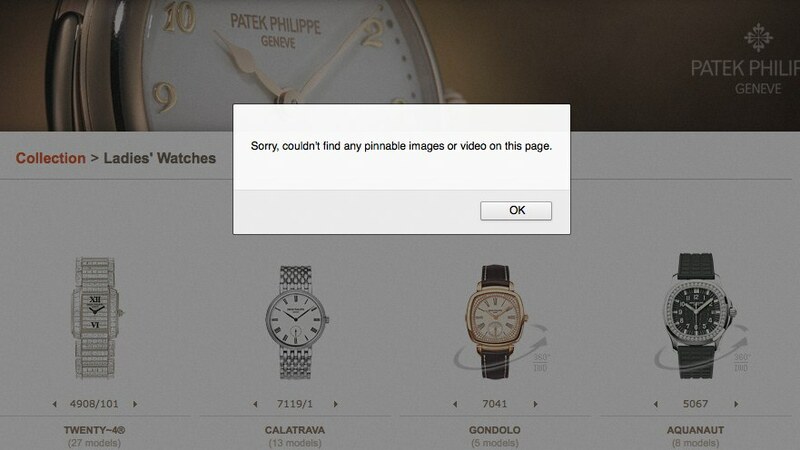 Bulgari gets it – their product images will travel across the web with full details, though they have neglected to include their brand name (viewing the image as a discrete file, out of context and as an independent object, should inform how you think about its ability to act as a marketing vehicle. It could end up anywhere). And finally – the dreaded Flash website, which doesn’t let me share much of anything, on Pinterest or elsewhere (never mind mobile). In researching this post, I also found something a little surprising: when we think about marketing in this context, that it’s essentially everywhere, and every image, file, graphic, video, whatever your organization produces, needs to be looked at through that lens, guess where best practices in metadata popped up? On sites that are fully accessible to the visually and hearing impaired. The descriptive text, while generally missing brand names and a marketing perspective, was far superior to the limited data surrounding websites that did not comply with accessibility standards. Interesting convergence. So – is the fact that marketing is everywhere a good thing, or a bad thing? Are you thinking about it this way? I’d love to hear your thoughts.